The Local Dirt: Enjoy All Things August this Saturday at HFM! Sweet corn, peaches, apples, pears, and knife sharpening! Summer is flying by and as we head into the later half of August, our vendors have got lots of great products to fill your market baskets. At this point in the year the market is full of summer favorites like tomatoes, peppers, corn, and peaches and we've started to see signs of fall's arrival in the form of apples and pears. Protein of all types is abundant and our bakers are ready with loaves and pastries. As signs of fall arrive at the market, summer favorites inevitably start to fade away. 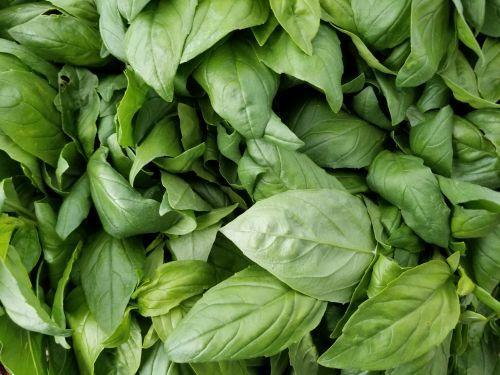 Be sure to grab some basil this Saturday to blend up a batch of pesto to freeze for splashes of summer in your dishes all winter long. After three markets away Dragonfly Forge is back and ready to bring your knives back to life! 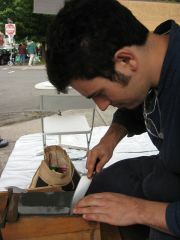 Bring your kitchen knives and other edged tools to market this week for sharpening at their booth on 44th Ave. 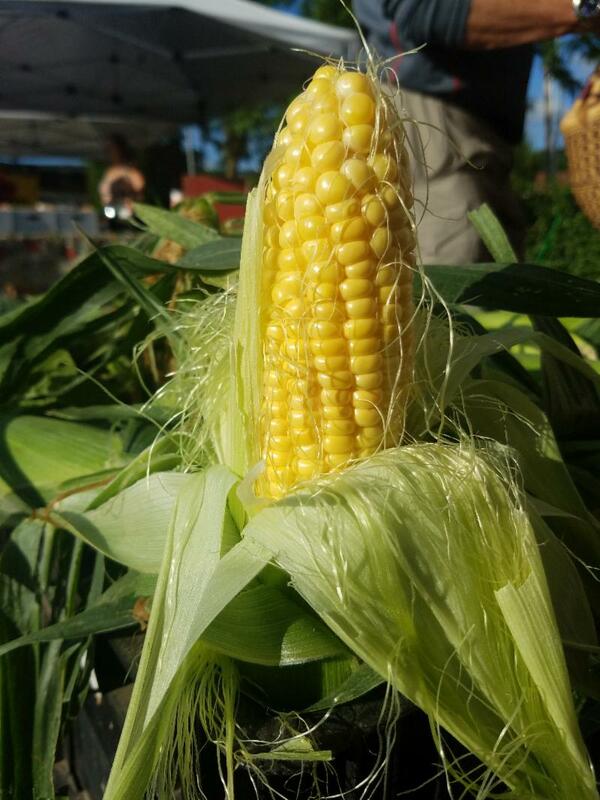 The time for sweet corn is now! Pick some up from Big B Farm, Happy Harvest Farm, and Sun Gold Farm and be sure to eat soon after buying as the closer to harvest it is the sweeter it will be! Kiyokawa Family Orchards' stall will be full of variety this week! 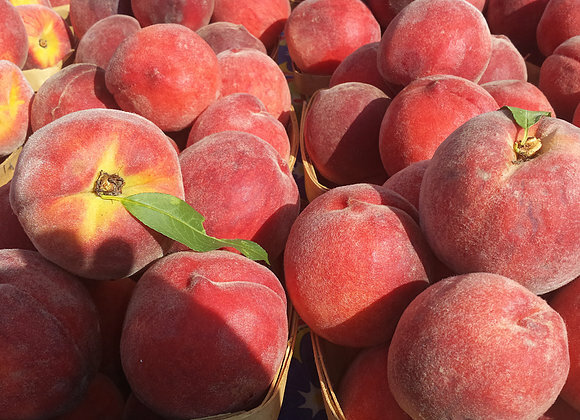 In addition to the first apples and pears of the year, their Organic Red Haven peaches will be at their peak and ready for you to bite into. Got any extra shopping bags laying around? 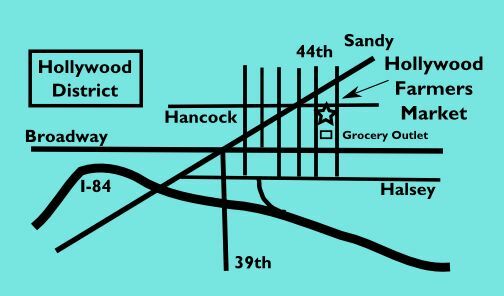 We collect durable, reusable shopping bags for community use at the market. 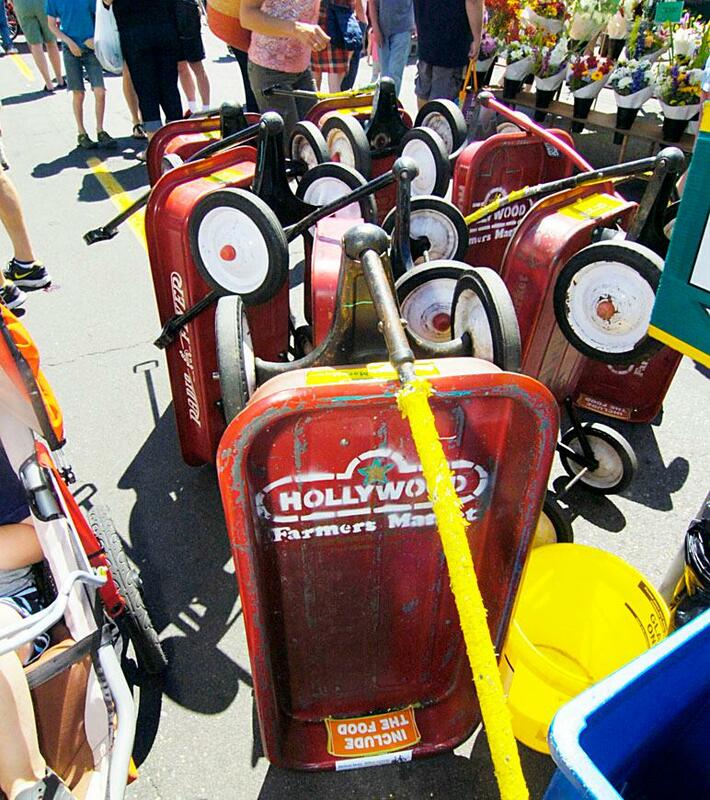 If you have any extra you can part with, please leave them in the metal bins on either end of Hancock St for any forgetful shoppers to grab. Eggplant - Eggplant was sent by the gods to test us. It will soak up oil like nobody's business and it tastes terrible when undercooked. To successfully prepare eggplant: Cut the eggplant into pieces - small to medium chunks are best. If the eggplant is big and tough-looking, you can sprinkle it with salt, let it sit and blot the resulting liquid from the surface. If you've got a fresh, firm, cute eggplant from the farmers' market, however, don't bother. Start with a small bowl of olive (or canola) oil at your side and with a heat-proof brush. Heat a frying pan to medium-hot, brush it with oil, allow it to heat slightly, and then add the eggplant. Cook it until the surface of the eggplant is a medium brown, then brush some more oil in the pan, and turn the chunks on another side. Continue brushing and turning until all the sides are beautifully browned. Now cover the pan, turn the heat to super low, and let the eggplant steam itself until it collapses. Above all else, the flavors of cooked eggplant should be sugar & cream, not acid & oil. Broccoli & Cauliflower - Eat the stems too! Cut the florets from the stem, then peel the tough skin from the stalk. Slice or dice the tender 'inner' stem, and use it along with the florets. Chard - Chard is two actually vegetables: the leaf and the stalk. Separate the leaf from the stalk by holding the stalk with one hand and ripping the leaf away with the other, moving from bottom to top. At a certain point, the stalk will come off with the leaf. Cut the stalk in 1/2-inch slices. Blanch the greens in salted water and remove, but keep the water. When the greens come out, add the stalks to the same water. Blanch until there's no crunch. Dress the greens with olive oil, garlic and parsley. Dress the stalks with a vinaigrette. For the ultimate peach pie: Cut peaches into thick slices and place in bowl. Mix together 1/2 cup sugar and 2-3 Tbsp flour. Toss with the peaches until well combined. Add 1/2-3/4 cup heavy cream. Make (or buy if you must) a double pie crust. Put one crust in a pie pan and fill it with the peach mixture. Roll out the top crust and use a water glass to cut a big circle in the center. Place the crust on top of the pie and crimp the edges together. Bake at 375˚ in the lower third of the oven for the first 15 minutes, then lower temperature to 350˚ for another 45 minutes or so. Try to let it cool before you devour it. We're in the height of peach season! 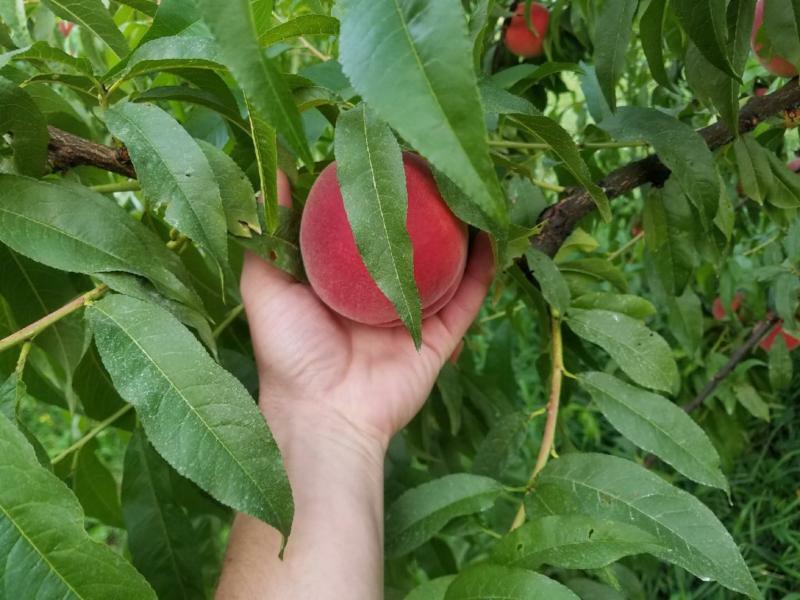 Diamond Princess are ProFarm's favorite peach variety for canning, with juicy firm flesh and an attractive red tint around the peach stone (which comes out easily). This week ProFarm will have a $35 special on 20-lb. boxes of Diamond Princess peaches! All of Olympia Provisions' traditional dry salamis are delicious, but for those lovers of spice, the Chorizo Navarre is the one! Flavored with sweet paprika, garlic, and cayenne, the spicing adds a kick, without overwhelming the flavor of the pork. This Saturday Stone Barn Brandyworks makes their monthly visit to the Hollywood Farmers Market, and will be bringing their seasonal Willamette Strawberry Liqueur! It's made with Hood strawberries, brandy distilled from local J. Scott Cellars white wine, and organic sugar. It has the aroma and flavor of fresh-made strawberry jam, and is perfect for a prosecco cocktail, or just on top of ice cream. Stop by their booth this Saturday and try it!